One of the newest additions at Palo aboard all four Disney ships is an incredibly flavorful Bloody Mary drink. It’s the perfect addition to our world-class brunch in this adult-only fine dining restaurant. 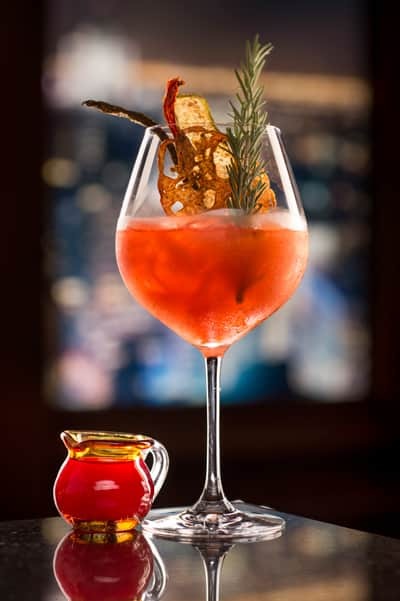 To fully enjoy the flavors of the Palo Bloody Mary, which is set apart by its chef-prepared gourmet garnishes, join us for an exquisite meal at Palo on your next cruise. Pair the drink with one of our savory brunch menu items, like the roasted red snapper filet or the spicy Italian sausage flat bread, for the ultimate brunch experience. Infuse the vodka with radish. Do not use horseradish, as it will overpower the drink. Blend or muddle heirloom tomatoes. Remove the skin first if you prefer. Prepare a glass full with ice, and add yellow tomato juice, heirloom tomato juice and vodka. Muddle fresh ginger root, and strain juice into glass. Add a pinch of Hawaiian sea salt and a pinch of cayenne pepper. Add a splash of yuzu juice and whiskey Worcestershire sauce. Once all ingredients are in the glass, stir gently to blend the drink. Garnish for the finishing touch.